It’s a done deal. 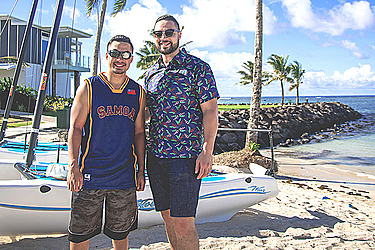 Duco boss Segiali’i David Higgins will be heading to London in a few days to seal the deal that will see his charge Lupesoliai La’auli Joseph Parker in a legacy fight against Anthony Joshua. Once minor details are agreed upon, he will sign on the dotted line and shake hands with his opposite equal, Eddie Hearn. Thus ends a three month snarky tussle that started the moment Parker won his last fight against Hughie Fury in September. The Joshua fight will nett Parker NZ$12-13 million and will take place either in late March or mid-April. It will secure Parker’s financial future according to Higgins. The major chasm that existed between the two camps is no longer a fissure in the negotiations. Where they were miles apart at the start and totally lost in an abyss of disparity, Parker at 40% and Joshua at 20% of the purse, any differences have now disappeared in the face of an agreeable compromise. Higgins was not at liberty to reveal the exact purse split. It will be a third / two thirds split give or take. In any case, Parker will get his Christmas wish to fight Joshua before WBC champion Deontay Wilder and earn his biggest pay day to date. The deal will also go a long way to putting some cash back in the coffers for Higgins and his 50/50 partner Dean Lonergan. For Duco and Parker, the risk and reward equation has reached an equal coefficient where belts and titles versus dollars meet at a zero balance. Should Parker lose the fight and his belt, he can retire if he wishes on his massive earn - risk equals reward. For Anthony Joshua if he loses on the night, he will forgo three belts but will nett $37m NZD to go with the $50m he earned in the Klitschko fight. Losing is not the end. There is a light at the end of the loser’s tunnel. Both are young enough to re-join the queue and plot a comeback. In a way, the agreed deal makes sense. Quite apart from the commercial pull the two fighters each bring to the mega fight, it is Joshua who has a lot more at stake. He is putting up three belts - WBA, IBF, IBO - to Joseph’s singular WBO belt. The victor will take all four belts toward a full unification of the heavyweight division. The historic deal came about through a careful strategy of baiting. There is no secret that Higgins started to poke at Eddie Hearn around the time of the Parker/Fury fight in Manchester. Then it was an all-out campaign of niggle and fault finding pointed directly at Anthony Joshua’s glass jaw and robotic movement in the ring, even questioning his mental ability. It didn’t stop there. Joshua’s search for his boxing Neverland by comparing himself to Roger Federer; and then verbalising his admiration of the deposed Zimbabwean leader Robert Mugabe earned colourful scorn from Higgins. Parker meanwhile used boxing speak to probe Joshua’s chin and he promised to knock Joshua out. The tactics have worked. Joshua is rattled into a deal with Parker. Higgins makes no apology for the carefully worked gimmick. In boxing terminology it was a fair fight, not clean but fair. Both camps traded barbs, with Joshua calling Parker the “mouth from the south” and a promise to knock him out. Methods used were deliberate but not dirty. It is less offensive than actually knocking someone out in the ring according to Higgins. The outcome has justified the means. Parker has a fight date to look forward to as a result. The fault-fact-finding on Joshua has done Joshua a favour. He now knows that Parker will target his chin. He also needs to have a lot more stamina and versatility than he showed against Carlos Takam. Might we see a slimmer and more mobile Joshua when he lines up against Parker? On the other hand, the Duco goading came with a firm belief within the camp that Parker will topple Joshua. But he will need to have a lot more armoury than the KO punch. That glass jaw will be well protected on fight night and you can bet Joshua will be much less of a stationary object. Win or lose this fight will salvage some huge losses for Duco Boxing in 2017, earned largely on behalf of their key asset in Parker. The Hughie Fury no-show early last year followed by the Cojanu Razvan replacement side show cost Duco a mint. The substitute Parker/Fury fight in Manchester in September was also a financial liability. That matchup did not capture the imagination of the British boxing public before the fight and even less after it. The major TV channels stayed away from the fight denying Duco any meaningful share of going to Britain. Parker’s value, according to Hearn took a major hit as a result and this became the key tool in the negotiations for Hearn. That is now all behind the two promoters. An announcement is forthcoming, within the next two weeks says Higgins. There are final details to agree on such as officials and judges. The venue is also to be finalised. It is looking likely to be held somewhere in Britain in London, Manchester or Cardiff the major venues. Higgins did not rule out Barcelona’s 99,000 Stadium at Camp Nou as a venue. Those are minor matters to be sorted out once Higgins reaches London and faces Hearn in a final meeting of the bosses before the fight can be announced. The deal is done, only the dusting of loose ends is left for the lawyers to supervise.